A job interview can be formal and stuffy or informal and relaxed. It can be conducted over the phone, or with video conferencing, or face to face, which is ideal. This article is aimed at helping you learn how to conduct a job interview in person. Follow these guidelines and tips in order to land the perfect candidate for the position that will drive your organization towards success. Great employees are made of not just the required minimal experience, qualifications, and credentials, but they are also problem-solving, team builders that drive a business in the direction of success. Your job as an interviewer is to recognize what your business needs to promote success, and how you will measure success within the position. Take a look at your best employees, your top performers, and determine their best qualities. How you identify your needs, paired with knowing what kind of attributes will help solve those needs, will put you and your business on the right course for hiring the ideal applicant. After you’ve determined what it is that you’re looking for in a candidate, you have to then determine how you will find them. Employment agencies can be helpful if you’re overloaded with CVs and resumes coming in from every angle. Their job could be to fill the position full stop, or they can simply help in streamlining the process for you by weeding out the applicants that don’t have the required qualifications or experience. Once you’ve got a few contenders, you can decide on your interviewing style. Formal, face to face, straight forward interviews work for some, but others may prefer something more relaxed. A business lunch or a round of golf for example, can really help you get a feel for the interviewee’s attitude and interpersonal skills. Getting to know a candidate on a more personal level will serve you in measuring who will fit with your corporate culture best. The hiring process will be much easier if you’re as prepared for the interview as the interviewee. Your preparation will show the candidate that you know how to conduct a job interview in a professional and effective manner. You must gather pertinent information about the position, such as salaries, benefits, vacation policies, as well as an accurate and specific job description. What qualities are you looking for in your ideal candidate? What qualities would make your ideal candidate indispensable? Organize yourself by preparing a list of questions you want to ask the applicant; questions that will help you determine if they have what it takes to get the job done. This will keep you focused during the interview, concentrating on filling the position. If you’re not the one who is fielding CVs, then make sure you familiarize yourself with the candidate’s resume before they come in. Otherwise, you’ll put yourself at risk of sounding redundant and careless. Remember, the ideal candidate is also interviewing you. That brings us to the next very important point; you must prepare yourself for questions the applicant may ask you. They’ll likely want to know about the values of the company or organization, and of course specifics on the position. And finally, allow yourself ample time for each interview. Don’t squeeze them in between meetings, or hurry them out the door prematurely. This is uncouth and bad-mannered. Recognizing that candidates are likely to feel nervous from the get go, before even walking into the door will turn you into a compassionate recruiter who knows how to conduct a job interview effectively. Their mind is racing with questions about what you will be like, what kind of questions you will ask them, if they look the part. You need to be empathetic about this by doing everything you can to minimize their stress level by making them feel welcomed and comfortable. After all, people under high stress often don’t perform as well as the normally would. Before the interview, you could send the candidate a brief description of what you’d like to discuss, as well as your organization’s dress code. 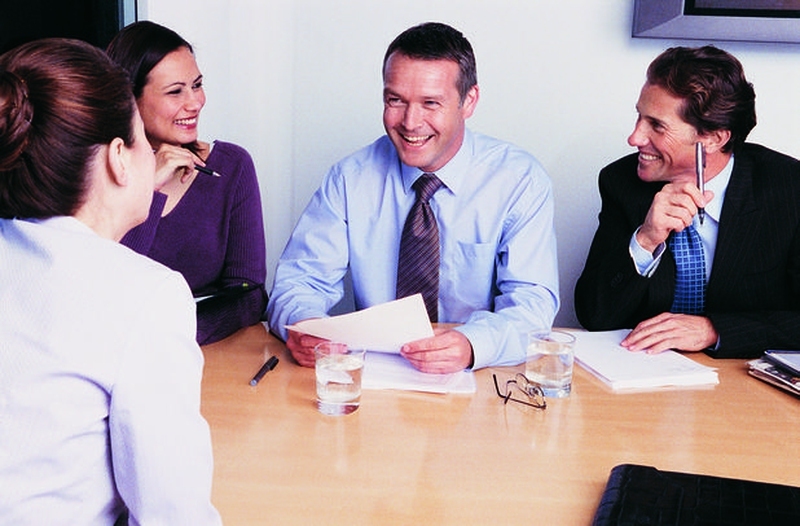 Do your best to accommodate the interviewee at a time that is convenient for them. Reducing their stress and yours will result in a more dynamic, productive, and comfortably professional dialogue. Grilling your candidate as if they are in a cross-examination won’t do you or your business any good. The goal is to have a fluid and easy conversation. Gathering as much information as legally possible about the candidate prior to the interview will help you formulate the right questions to ask. Listen to your candidates answers, and encourage them to delve deeper on any particular point that sparks your interest. Once your candidate understands that you’re engaged in the conversation and interested in what they’re saying, rather than reading off a bulleted list, they’ll speak more openly. You want to know how your candidate can make your company perform better, and how they will take on their position. Talk to your applicant about some processes in place in your organization, and ask him or her to isolate ineffective methods within said process. Then ask them what they would change about the practice to make it more efficient. Ask them about their problem-solving skills, and ask for them to name an example of a time they were faced with an issue and how they resolved it. Ask rhetorical questions about what they would do if they were faced with complicated problems at work, and then ask about the consequences. As mentioned above, a truly stellar candidate is interviewing you as well. They want to know if they really want to associate themselves and their professional reputation with your company. Encourage your interviewee to turn the question and answer segment around, and let them know you’re ready to answer all of their questions. Here is the time to be honest and frank, make sure you answer thoroughly and thoughtfully. Be careful not to “sell” your company to the candidate, because a great candidate will be able to recognize a good opportunity. At the conclusion of what hopefully was a successful and productive interview, let your candidate know what the next steps are. Let them know if you’re interviewing more people, or if you plan to schedule a second round of interviews for the candidate to meet other members of the team. But most importantly, your candidate wants to know when they will hear from you. Give them a time frame and stick to it. Contact the references provided for you by the candidate. You should not go beyond your scope though, and discuss the candidate’s professional business ventures with other people in your network or theirs. Sometimes job searches are done privately, unknown to the candidate’s current employer, and it is not your place as a potential employer to interfere with that. If you’d like to contact other professionals not provided as references by the applicant, you must ask for their permission first, and ask if their current employer knows that they’re looking for another job. Finally, have a look at this insightful and instructive video about how to conduct a job interview.